Alsanna is a child of dark, one of the abyss spawn, a confounded quintessence of Manus and his Dark Soul. Like her sisters; Nashandra, Nadalia and Elana, Alsanna is a fragment of Manus’ emotions. She represents fear. She came to the Ivory King seeking protection, and being the highest ranking, most honourable and most selfless warrior in the land, he welcomed her into Eleum Loyce. Eleum Loyce was a land that birthed the Old Chaos. When the Old Chaos was birthed, perhaps at someone’s attempt to reignite the first flame, the people of the land fled. The Ivory King then arrived, and subdued the flame. He established an order of priestesses directed to appease the flame. How they did this is not known, but perhaps they offered themselves to the flames and were consumed. The vessel shield depicts a priestess who is containing fire within her. This indicates that the priestesses may have tried to contain the Old Chaos within them, like the Firekeepers of old, but instead were consumed, like the Witch of Izalith was by the Chaos Flame. The priestesses had attendants by their side called Retainers. These silent women existed to help the priestesses, and when the priestesses were gone, they were left to wander frigid Eleum Loyce without purpose. Alsanna wears the robe of a retainer. She may have been the Ivory King’s ceremonial retainer, one that attended on him for all things. The Ivory King in turn protected Alsanna and eventually fell in love. After this, it seems they were married and she became his queen, similar to the other sisters of Dark and their kings. Alternatively, the Ivory King may have loved Alsanna like a daughter, and gifted her everything upon his departure as an heir. Perhaps by natural atrophy, or perhaps by his proximity to a child of the Dark, the Ivory King’s magnificent soul began to degrade. The Eleum Loyce description indicates that the Ivory King’s strength was drained, as if by a deliberate act, though this could simply be because “the greater the flame the deeper the shadow” it may also be because Alsanna was, unbeknownst to the King, draining him of his power, as we are told in the Chime of Want description, that the minuscule fragments of Manus courted monarchs of considerable power, of which they desired make their own. Whatever the reason, when the Ivory King became aware of this, he left without a word, indicating he did not want to be stopped, and his departure ensured all things would be left to Alsanna. Before he left, he gifted to her the blade inscribed with the name of his Cathedral City; Eleum Loyce. This weapon has two intertwined blades, one light and one dark, a depiction of their relationship, and proof that the King was aware of Alsanna’s origins and nature, but loved her still. The Ivory King then took his Loyce Knights and assaulted the Old Chaos in an attempt to finally subdue it. But the King and many of his Knights were consumed. Some returned, but without a leader to guide them back into battle, they were left purposeless, though still faithful to the King’s final order to subdue the Chaos. The people waited for a long time for the return of their king, but when the outcome became undeniable, the people fled the city. Perhaps Alsanna prophesized that the Old Chaos would sweep through the city, and that the only option was to flee and open the gates to the frozen tundra. Alsanna is known as the Silent Oracle, and an augur of fear, it may have been a title given to her when she prophesized the doom of Eleum Loyce. She repeatedly warns the Player against any further progress into Eleum Loyce and urges them to turn back as the Old Chaos "hungers still". Alsanna herself seems to have control of the blizzard that sweeps through Eleum Loyce and the ice that protects her, so perhaps the people fled when the land became frigid and desolate due to Alsanna’s influence, or perhaps this was a result of the gates being opened when the people fled and Alsanna not stopping the incoming blizzard, even though she could have. Whatever the reason, Alsanna became the sole occupant of the frozen land and apparently the wielder of great power. After the people left, Alsanna was alone save for the protection of Aava, the King’s Pet. She remained in Eleum Loyce to warn those who might enter away from the Chaos it contained, and with the faint hope that her King might return. It may be that her apparent fear to leave the side of her King made her the bravest of all, when she refused to leave despite her belief that the Old Chaos would eventually consume her. Alsanna’s soul says that she is devoting herself to a ritual in hopes of appeasing the raging flame, though does not explain what this ritual is. It may be the ritual of the retainer. Alsanna is depicted kneeling before the Old Chaos and the Retainers around Eleum Loyce have the exact same kneeling pose. It may be that when a Retainer’s priestess was lost, that Retainer lost all purpose in life, and ritually prayed for their safe return or the safety of their souls. In the same sense, Alsanna was or at least may have considered herself the Ivory King’s Retainer. She therefore waits for his return, or his end at the Player’s hands. Though the ritual is said to be done in hopes of appeasing the raging flame, the motive behind the ritual is not explained. In Alsanna’s case it may be that she hopes to appease the raging flame in an attempt to put to rest her King’s soul. She seems to realise that the Old Chaos causes the souls of those consumed by it to burn in agony until they are destroyed by the Player, and because of this knowledge, grieves for the King and for the knights that were lost in the Ivory King’s final battle against the Chaos. Alsanna has the ability to put to rest the souls of the Loyce Knights. Within the actual game, it seems that this text is just added to indicate that we should approach Alsanna with our Loyce Souls. When the player does this, Alsanna begins to remove the ice that protects her. 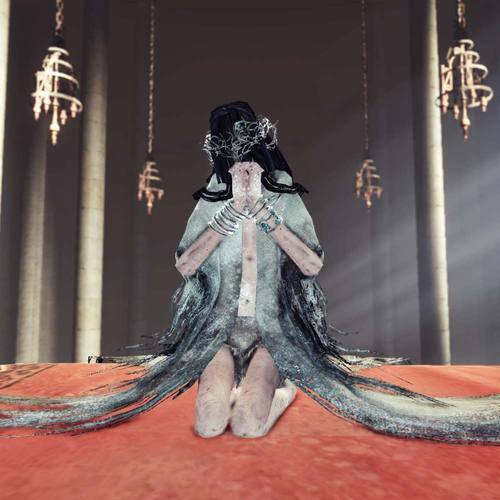 After possessing 50 Loyce souls and killing the Burnt Ivory King, Alsanna will allow the player to reach her on the throne, even giving over her soul. It seems that she genuinely does care for the King and his knights, and will increasingly trust the Player the more brave knights they put to final rest. Alsanna does not consume the loyce souls, but is simply content to know that they have been subdued. While the Old Chaos is not defeated, Alsanna still trusts the Player enough to allow them to approach her, and in some way it seems that the Player’s actions allow Alsanna to find peace. that which is sheltered in Eleum Loyce. stranger, will you lend me your strength? There's nothing here, nothing at all. Kind visitor, I thank you. Let me open the path to Chaos. The knights, reborn will follow your word. May you reach your journey's end, one day.